A database has been compiled of known inscribed and cross-incised stones, cross slabs, crosses and related decorated stones of the period under review. One hundred entries are recorded with details of name, present location, location of discovery or first record, NGR, classification and type, brief description and dimensions where known. In addition, association has been taken into account in respect of original location or discovery on the one hand, and subsequent association where stones have been gathered in one place. For example, a number of stones with records of original discovery at or about the same place as in the case of Penprys Farm (Llanor) Beddau Gwyr Ardudwy or Capel Anelog have associative value in respect of the potential for interpretation, whereas stones gathered in one place, as, for example, at Penmachno, have associative value in their potential for display and education. An assessment has also been made of the context of the stones as an indication of the degree to which they may be at risk or are secure. Of those stones which can still be located, 38% of all stones in the categories identified are at present within a church. Some form part of structural displays, as at Penmachno, others are known to lie loose on the floor of the church, others propped up in corners, under tables and in comparably inappropriate locations which do not take account of their potential for viewing or their long term security. 12% are in the walls of churches. Slightly more are built into exterior than interior walls. In the case of Llangadwaladr and Llansadwrn (Catamanus and Saturninus stones) the stones do not form part of the structure of the wall but have been placed there for display purposes but which nevertheless obscure potentially significant areas of detail. 10% are in church yards, in the open, some free standing and in some, probably rare, instances, may be in or near their original location. Others are loose, propped against a convenient surface or wall within the churchyard. 10% are in museums or galleries, on display. 7% of stones have been incorporated into churchyard walls. Five stones stand in the open, as gate posts, in farmyard walls or free-standing. 16% of the stones recorded are now lost. In respect of groups of stones, Llangaffo is easily the largest with six well-recorded cross-incised stones, a cross shaft, an incised cross fragment, an incised decorated fragment and one wheel-headed cross-head. There is also an important seventh century inscription, thought by Sir Ifor Williams to be significant marker in the development of the Welsh language. This latter was brought to Llangaffo from nearby Fron Deg. There would also appear to be several fragments in private possession. The significance of Llangaffo, for example, resides in their being a group, at or close to their point of original use, at the site of a probable pre-conquest church with the potential for recording and bringing together previously unrecorded fragments from the immediate environs. The stones are are, at present variously built into the churchyard wall, standing loose in the churchyard or in the body of the church. 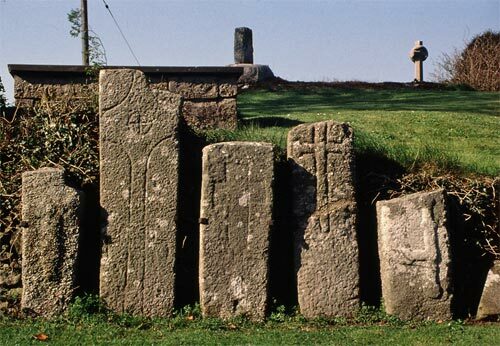 Nearby, Llangeinwen has four cross-incised stones in a very similar tradition. The first stage of this project was to identify a strong candidate for a structured programme of recording (which would require the co-operation and involvement of the local community) interpretation and presentation, and which should also ensure the conservation of the stones.